Many people and businesses have not taken part in a mediation. The Model Standards of Conduct for Mediators (2005) drafted by the American Bar Association Section of Dispute Resolution and two other organizations provides a good guideline for understanding the process of mediation. The Preamble begins with a definition of mediation: “Mediation is used to resolve a broad range of conflicts within a variety of settings.” That is a very expansive definition which is not too helpful. At its core, resolving conflicts is the central aim of mediation. Disputes and conflicts are complex systems that need to be addressed with professional care. Many individuals try to ignore the problem until it is disrupting their day to day life. Mediation training educates mediators in helping parties to communicate through clashing expectations, wishes, identities, and aspirations. Mediations are, in essence, difficult conversations between opposing parties. Mediators have differing backgrounds. Clinicians who have a master’s degree or PhD in Psychology, Sociology, or Social Work make up an important market of mediation. Attorneys, and retired judges make up another important market of mediation. Clinicians use their experience in treating issues of mental health and trauma to resolve conflict. Attorneys and retired judges use their experience from the practice of the law to resolve conflict. Perhaps it surprises you to learn that there is no requirement in Arizona to be a mediator. You do not need a single hour of training to hold yourself out as a mediator. Because of this it is a wise idea to reach out to a professional for a referral. If those are words you have never heard before, that is alright. The more that people and businesses put mediation clauses in their contracts, the more likely this information will be important for them. Standard I of the Model Standards is titled Self-Determination. This is described as “the act of coming to a voluntary, uncoerced decision in which each party makes free and informed choices as to process and outcome.” Arm-twisting (figuratively), not allowing breaks for the bathroom, or not allowing parties to leave all violate this standard. It is vitally important that the parties themselves are making the decisions of whether to continue to negotiate, walk away, or resolve the conflict. The mediator assists the parties by insuring they are not using the process to force the other side to settle. Mediation training teaches that the process often works on the psychological principle of scarcity put forth by Dr. Robert Cialdini. When something is scarce it is more valued. A mediation is the opportunity for the parties to openly discuss the hard issues and problem solve through the process. The mediator is trained on helping people communicate through emotional intensity. However, it is appropriate for the mediator to remind the parties that agreements must be voluntary. A party can freely choose to leave and not come to agreement. A mediator should be mindful that the principle of scarcity can be used to violate party self-determination. If a mediator keeps on harping on the costs of litigation, the time, the frustration then the mediator may be violating party self-determination. It is the party himself or herself that gets to decide whether to escalate a matter through litigation. Our attorneys at Denton Peterson, PC know which mediators value party self-determination. Impartiality is freedom from favoritism, bias, or prejudice. This means that a mediator should not pick sides. A mediator should not be picking who “wins” and who “loses” in a given mediation. Also a mediator should be calm and collected within the negotiation. Sometimes parties to a legal mediation want a legal evaluation on the merits of their claim. This puts the mediator in a tricky spot because a legal evaluation may lead a mediator to lose their impartiality—they are asking the mediator’s professional judgment on whether the law would favor one side over the other. If this is going to happen (and it often does) the mediator should disclose to the parties the possible loss of impartiality, and also the risk of being wrong on whether the law applied to the claim. A conflict of interest is a connection or relationship that a mediator has with someone or something that raises a question of the mediator’s potential for impartiality. A mediator needs to tell both parties of any actual or potential conflicts of interest. After the mediator, tells the parties about any actual or potential conflicts of interest, the parties may agree to continue with the mediation. The mediator must inquire to find out whether there are any facts that a normal person would find likely to create a conflict of interest. Is the mediator related to one of the parties? Does the mediator own stock in one of the business entities (or subsidiaries) and thus could benefit from the outcome? Is there some benefit the mediator will receive outside of the fees collected and experienced gained from the mediation? The mediator must be competent to satisfy the reasonable expectations of the parties. Competence deals with having the necessary skill level to mediate a claim—where was the mediator trained? What are the mediator’s qualifications? What is the mediators experience? A mediator should disclose any continuing training the mediator has received. Any training in cultural understandings should also be disclosed or explained to the parties who are present. If for example, a party is selecting a mediator for a business dispute, it would be important to know the mediator’s background in business. 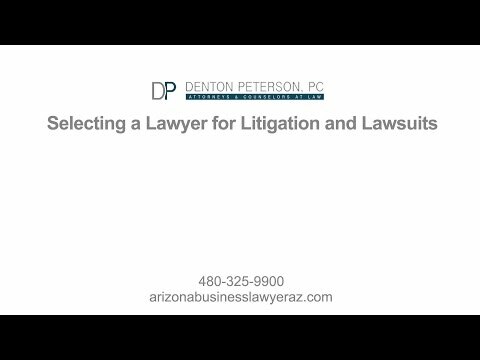 Our attorneys at Denton Peterson, PC have a wide range of experience in mediations involving commercial disputes, business disputes, real estate disputes, employment disputes, etc. And, as a result, the attorneys at Denton Peterson, PC are familiar with various mediators with experience in these areas. Confidentiality is another hallmark of the mediation process. Confidentiality means that communications made during the mediation are not disclosed outside of the mediation. The underlying purpose for confidentiality is to allow the parties to have frank and open discussions about the issues in a dispute without fear that the information will be discussed outside the realm of the mediation. The free flow of information in the mediation process will generally help facilitate a more meaningful mediation for all parties involved. However, it is important to recognize that threatened or actual violence that occurs during the mediation (which is very rare) is not confidential. The mediator will explain how the rules of confidentiality apply in a given mediation. Quality Process is addressed in Standard VI. This guideline is all about promoting fairness to the parties. Important parts of fairness are establishing honesty and candor among the parties. Also it is crucial to note that a mediator shall not misrepresent any material fact or circumstance (i.e., facts or circumstances that are likely to influence one party or the other in determining whether to settle) in the course of the mediation. The gist is that deception may not be used to gain concessions. For mediators the Model Standards are the guidelines for putting together a fair process of resolving conflict. It is important that you know whether the mediator values these guidelines. Discuss these standards with the mediator and it will help you evaluate the mediator, otherwise you may be walking into a negotiation with no rules which is beneficial to no one. If you have questions about The Model Standards of Conduct for Mediators, please contact our firm.